This Innovative Hidden Camera will give you a peace of mind as you will be able to know what is going on in your home or office. 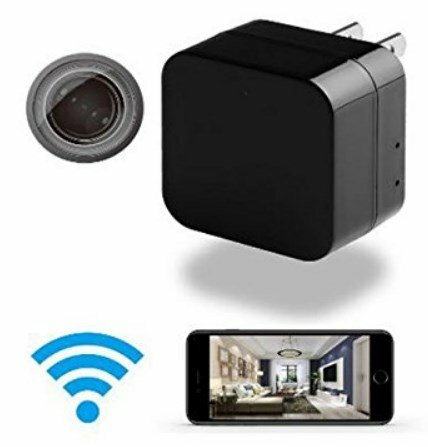 This USB wall charger features a 1080P HD hidden camera lens allowing you to easily monitor any room in your home or business. It is easy to setup, just plug it into any wall outlet. It features motion detection and allows real time streaming on your smartphone device. No matter where you need covert video surveillance, this mini charger camera will blend in easily. This device has no physical "pinhole" and thus no one will suspect there is a camera hidden inside. This can be disguised as a phone charger. GREAT VIDEO QUALITY - Captures crisp clear 1080P videos in any room. It can take wide angle shots so you can easily see what's going on. Compatible with Android, PC, and Apple devices. WIFI CAPABILITY - View real time videos from your remote wireless device anytime & anywhere. Just a touch away! EASY TO SETUP - The hidden spy camera model does not require any type of installation. The small camera comes ready to use. Just plug into an outlet and play! A owner's manual is included for your convenience. MOTION DETECTION - Camera will auto record when movement is detected. This allows you to save on storage space. Loop recording will automatically overwrite the oldest files when memory fills. 100% SATISFACTION GUARANTEE - We have a 30 day money back guarantee if you are not 100% satisfied with your product. If you have any questions about this product by Justoos, contact us by completing and submitting the form below. If you are looking for a specif part number, please include it with your message.